Well friends, it happened. We sold our house, I am packing my bags and getting ready to move into a new place that I can't wait to show you today! OK, so maybe I should give Kelly a heads up first, but I have full intentions of moving into her beautifully remodeled master bedroom closet. Seriously guys. I really have contemplated just crashing her house and begging her to hand over the keys. There is not a room in her home that I don't love, but I think you would find me camping out in her new closet nine days out of ten. That's not that creepy, is it? So what is so magical and wonderful about this sweet closet I am lusting over? Well, not only did Kelly and her husband build the entire thing from scratch, they took things a step further with loads of custom features and details. I will let you hear it directly from her first, and then I will get my gushing out at the end. 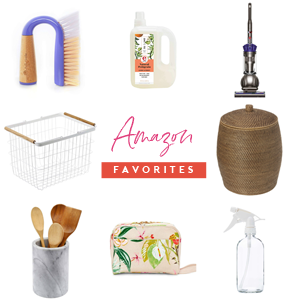 "Technically, the function is to store all my clothes, shoes, purses and accessories, and it does the job so well! But really? It's such a happy place for me! Every morning I draaag my tired little self out of bed and across the room, turn on the light to my closet and smile. Cheesy, right? I know. I'm sorry." I purged everything that didn't fit me today, right this second, at the exact size I am. Everything in the closet fits and is wearable today. Everything is easy to access and at my fingertips. The stuff I use most often is at eye level; my out-of-season stuff is stored in the harder-to-reach high shelves. 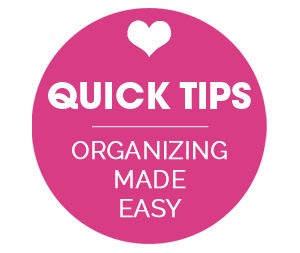 It looks fab when everything is put away, so that's an extra motivator!" 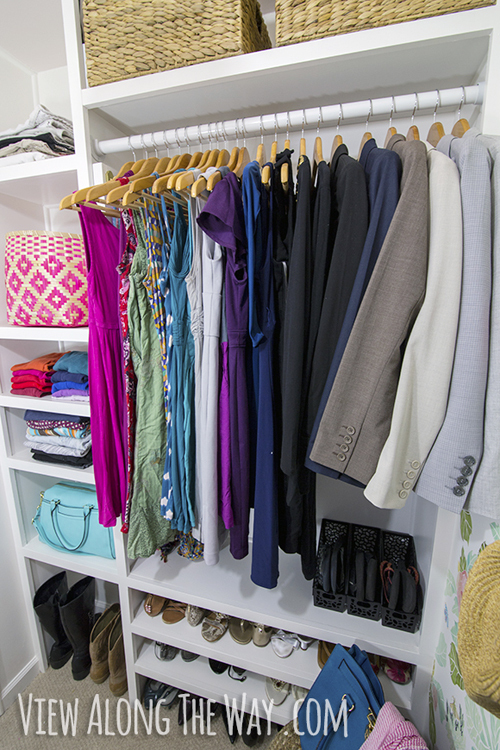 "We built the shelves (tutorial here) and designed them around how I use my closet. 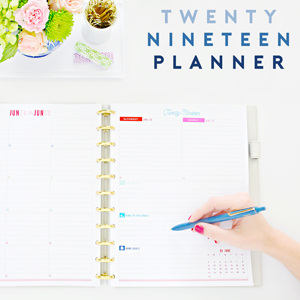 We really thought through how to best use the space, and that's gone a long way to keeping things organized. I think the little necklace hooks are one of my favorite parts! They keep my necklaces from turning into colossally tangled piles of ruined beads, and suddenly I actually know what jewelry I own and am able to dress more creatively." "The wallpaper! It was my first time installing wallpaper and I couldn't believe how easy it was. 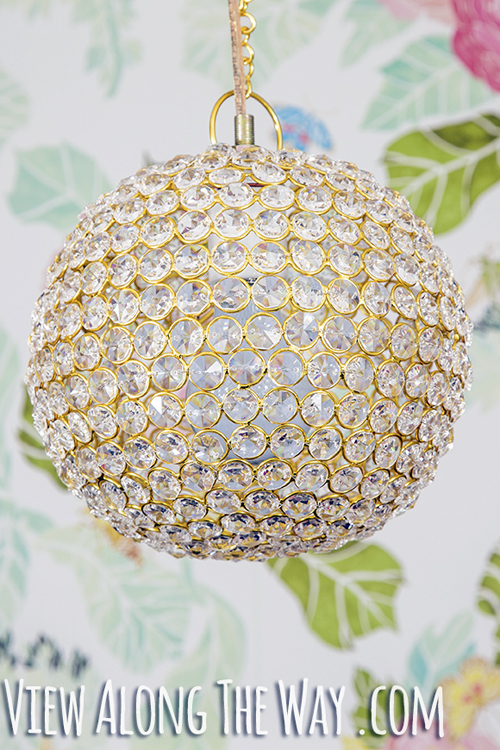 And, of course, that sparkly DIY crystal ball chandelier. 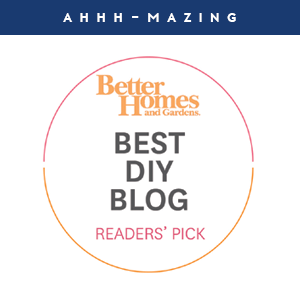 A crystal chandelier in the closet makes me so swoony, and we made it on a budget to look like the more expensive versions at Horchow and Serena & Lily. Every girl needs a crystal chandy in her closet, can I get an amen?" "Everything in this room was a DIY! 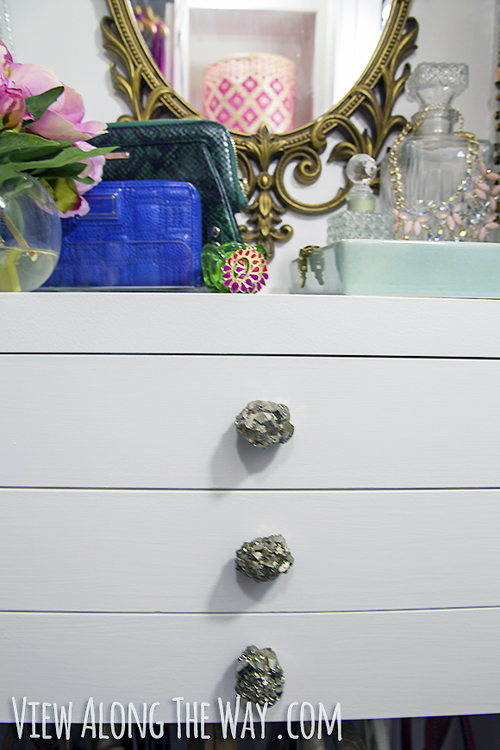 We made the shelves and the drawers, made DIY velvet drawer lining and Anthropologie knock-off stone knobs, made the chandelier, even the little art (and I turned it into a free printable you can grab here). 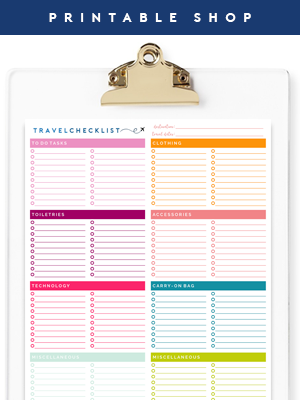 And we even created the slide-out scarf and belt organizers!" "A million little ways! I can see all my jewelry and scarves now, so I know what I own and wear more of them. Since I purged all my "just in case I gain/lose weight" clothes, deciding what to wear is much quicker and easier, because everything works. It's gone from a stressful space to a soothing, cohesive organized heaven. 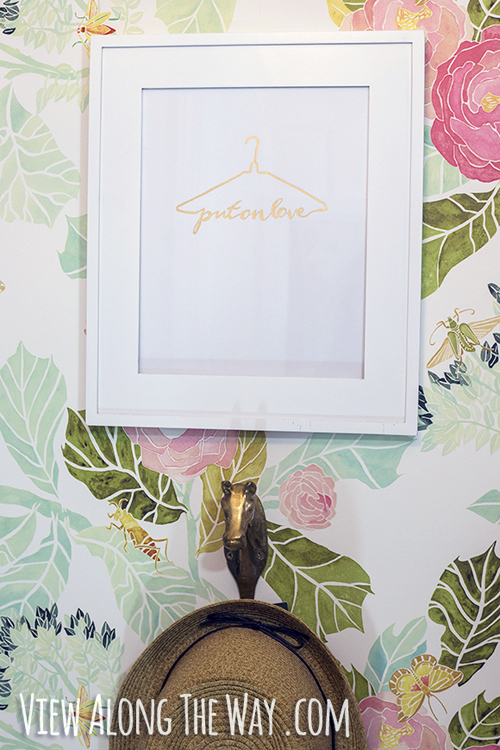 (Replacing the mismatched hangers with wood made such a difference in how relaxing the space feels!) Instead of dreading putting away my clothes or getting dressed, it's fun now! Ultimately, it's replaced a source of stress in my daily routine with one of joy and peace." And the story is even more exciting when you get to take a peek at a before and after. 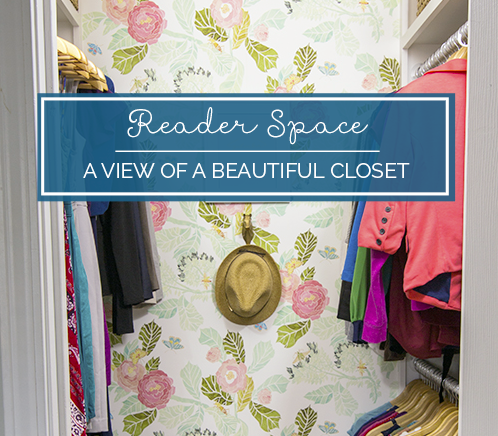 This space was a labor of love and a desire to create a classy closet on a budget. Kelly did everything right and ended up with a space that she not only adores, but one that is simple for her to maintain as well. 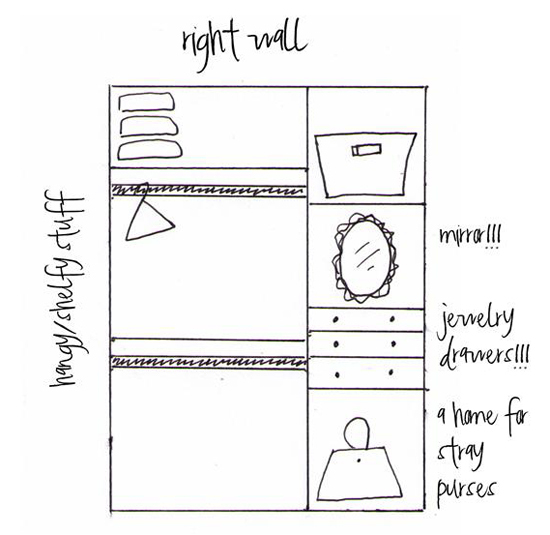 At the beginning of the project, Kelly assessed her closet space and storage needs and drafted up a plan. 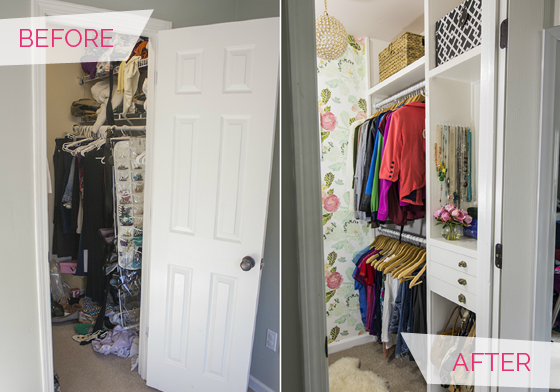 By giving herself a vision for the space and planning out all of her storage ahead of time, she set the duo up for success. 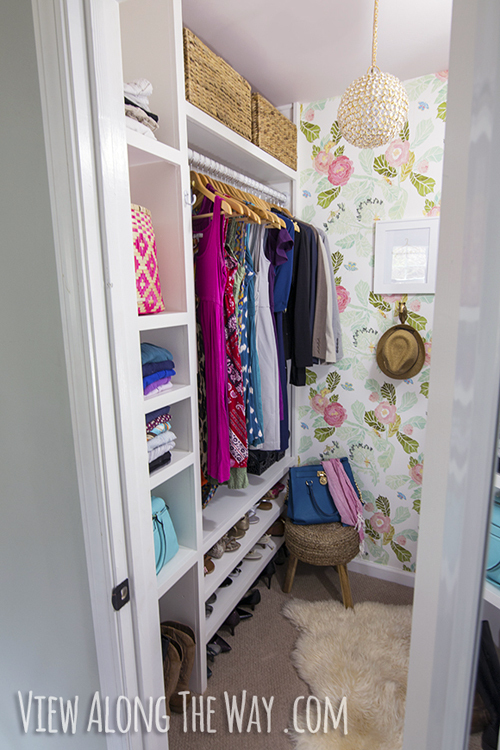 They built everything from the shelves to the drawers, which allowed them to 100% customize the closet for their specific needs. Talk about a DIY power couple! 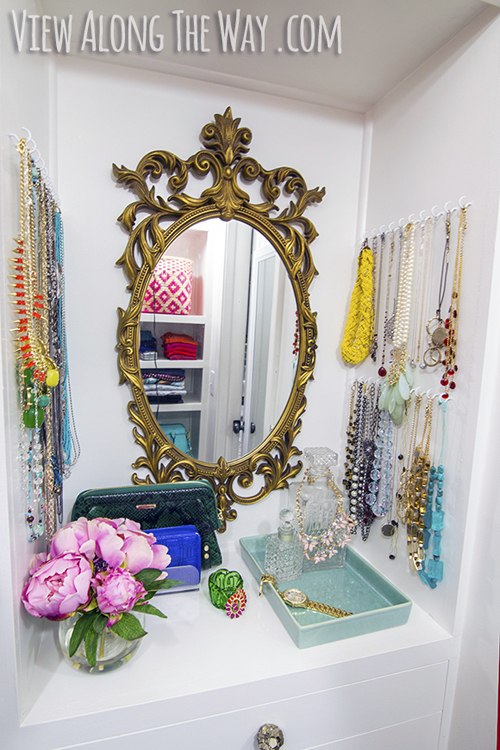 And how fabulous is her jewelry nook? I love that everything is out in the open and simple for her to access and put away. As she mentioned, the entire closet really allows her to create an endless variety of clothing combinations. But I can't end the post without declaring my love for all of the special finishing touches. The wallpaper is girly glam and completely set the stage for the entire project. It is also the main reason I will be taking up residence. They also DIY'd some Anthro inspired hardware and a beautiful chandelier. 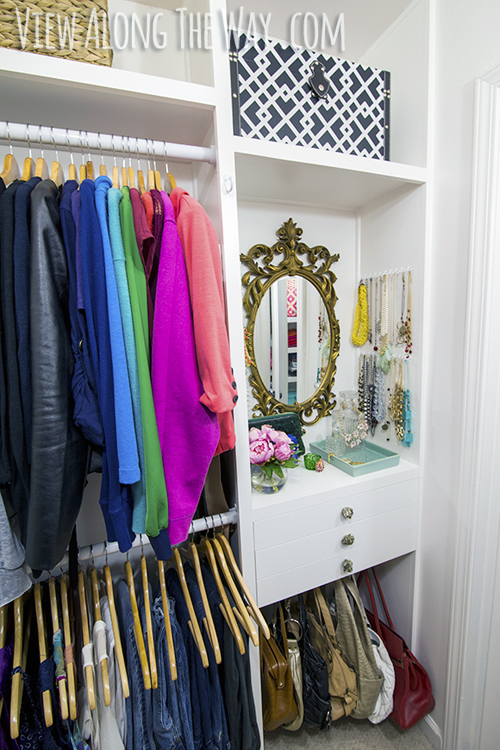 These beautiful finishes put the FUN in their functional closet makeover. You can find even more swoon worthy details and photos over at A View Along the Way here. I had the exact same reaction of wanting to move into Kelly's closet the first time I saw it. So gorgeous, drool-worthy and calming all at the same time! Holy cow - that closet is amazing! I love it! That wallpaper is to die for. This closet is seriously a DREAM!! LOVE it! 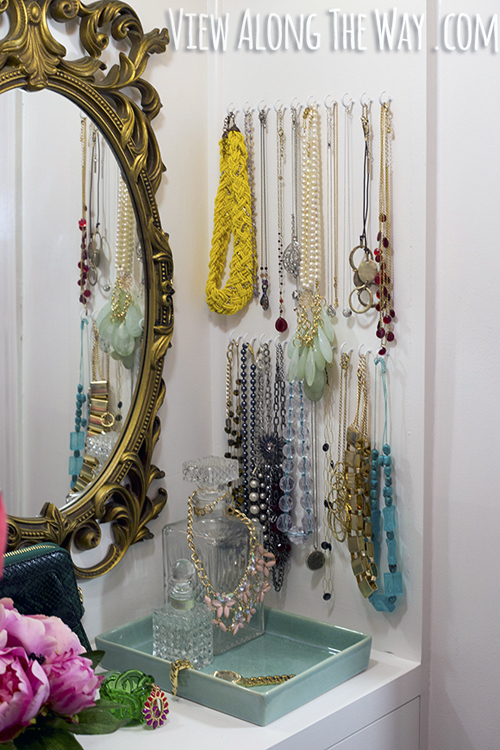 Oh my goodness, I love her closet! I've got her blog saved so I can start following along. Thanks for the intro Jen! I want so badly to implant this closet into my home!! What a great closet!! 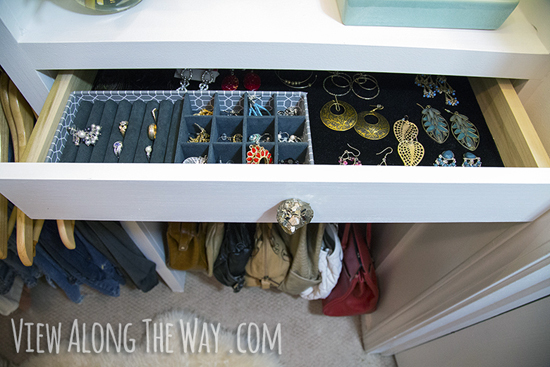 I think my favorite feature (it changes every time I look) is the jewelry area - the hooks, the drawers, everything! 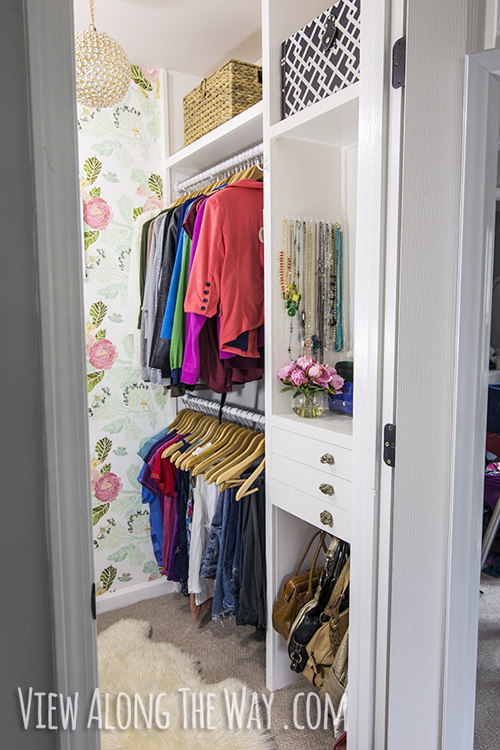 I am envious of this gorgeous closet! 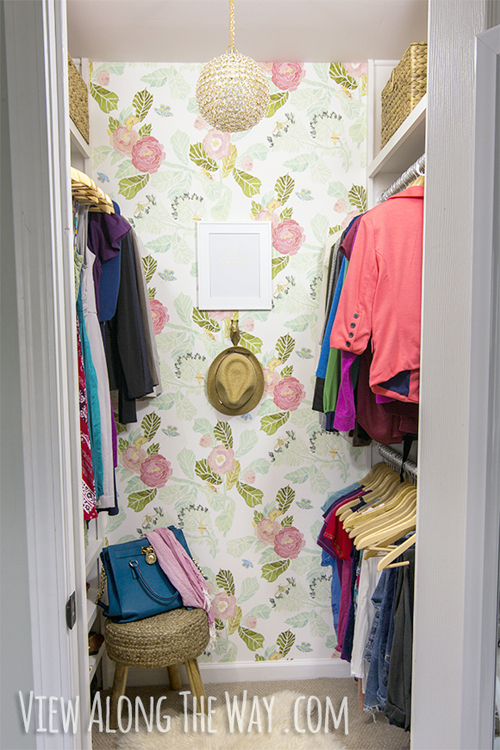 It is the perfect closet! This is probably the best little closet I've ever seen!